We can't live without oxygen. Our cells rely on oxygen as the final acceptor of electrons in respiration, allowing us to extract far more energy from food than would be possible without oxygen. But oxygen is also a dangerous compound. Reactive forms of oxygen, such as superoxide (oxygen with an extra electron), leak from the respiratory enzymes and wreak havoc on the cell. This superoxide can then cause mutations in DNA or attack enzymes that make amino acids and other essential molecules. This is a significant problem: one study showed that for every 10,000 electrons transferred down the respiratory pathway in Escherichia coli cells, about 3 electrons end up on superoxide instead of the proper place. To combat this potential danger, most cells make superoxide dismutase (SOD, shown here from PDB entry 2sod ), an enzyme that detoxifies superoxide. As you might guess from its name, SOD dismutes superoxide. Dismutation is a term that refers to a special type of reaction, where two equal but opposite reactions occur on two separate molecules. SOD takes two molecules of superoxide, strips the extra electron off of one, and places it on the other. So, one ends up with an electron less, forming normal oxygen, and the other ends up with an extra electron. The one with the extra electron then rapidly picks up two hydrogen ions to form hydrogen peroxide. Of course, hydrogen peroxide is also a dangerous compound, so the cell must use the enzyme catalase to detoxify it. SOD has recently gained notoriety for its connection with amyotrophic lateral sclerosis, more commonly known as Lou Gehrig's disease. This disease is a degenerative disorder that leads to selective death of neurons in the brain and spinal chord, leading to gradually increasing paralysis over a few years. Most cases mysteriously appear in later life, with unknown cause. But about a tenth of cases are hereditary, caused by mutations that may be inherited from parents. Recent research has shown that one of the mutations is found in the gene for SOD. Scientists are now studying the role of SOD in the disease, hoping that this knowledge will lead to new treatments and cures. Forms of superoxide dismutase using different metal ions. All organisms appear to have one form of SOD or another, but they have taken several approaches to the challenge. These enzymes all use different metal ions to perform the electron-shuffling reaction. Our own cells build three types of SOD. 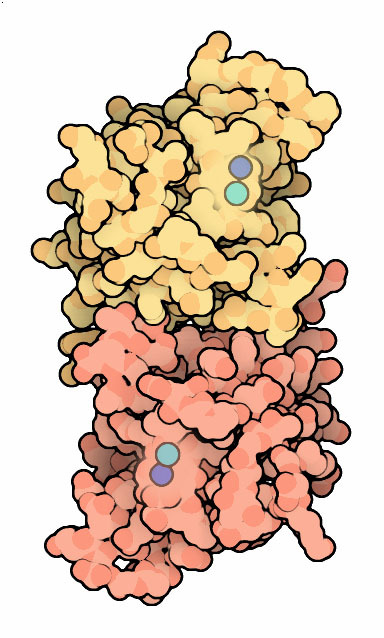 Copper, zinc SOD (shown here from PDB entry 1sos ) floats around inside cells to scavenge any superoxide, and a similar one is made with a sticky tail that glues it to structures outside of cells. A separate manganese SOD (PDB entry 1msd ) is used in our mitochondria. Bacteria build a variety of different SOD enzymes, including an iron SOD (PDB entry 3sdp ) and even an unusual nickel SOD (PDB entry 1q0d ). 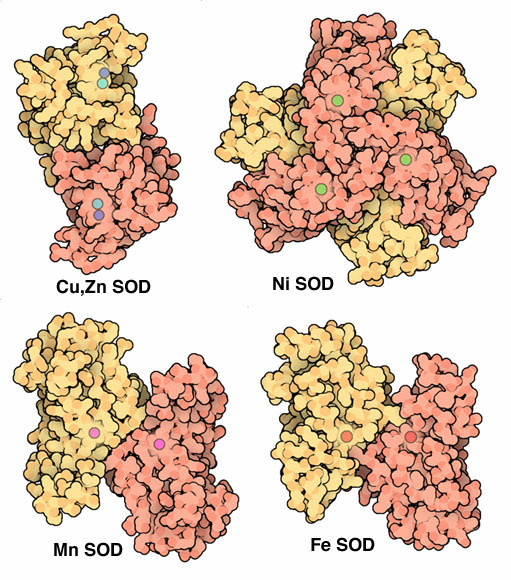 Cu/Zn superoxide dismutase (PDB entry 2sod ) is a very efficient enzyme. 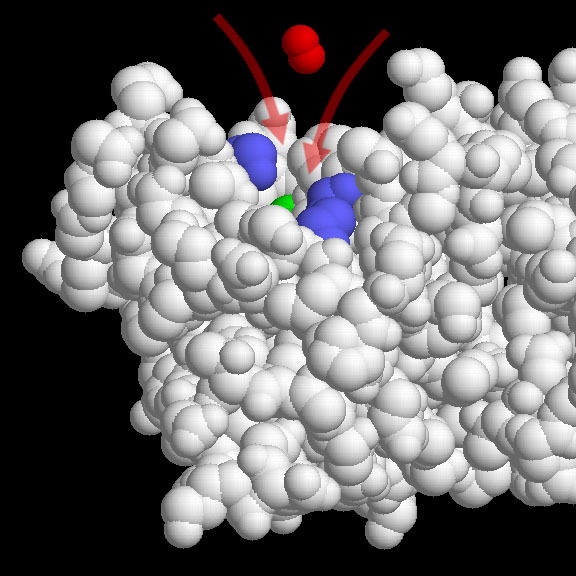 Researchers have determined that one out of every ten collisions between superoxide and the enzyme will lead to a reaction. This is far more than expected, since the active site covers only a small portion of the enzyme surface, and we might expect that most collisions would occur somewhere else on the surface. The shape and characteristics of the active site, however, may give some hints to this efficiency. The active site is funnel shaped, with the copper and zinc (colored green here) at the base of the funnel. The strong positive charge of the metal ions, along with two nearby positively-charged amino acids (colored blue here), serve to draw the negatively-charged superoxide (red) into the funnel. This picture was created with RasMol. You can create similar pictures by clicking on the accession code here and picking one of the options for 3D viewing. P. Pasinelli and R. H. Brown (2006) Molecular biology of amyotrophic lateral sclerosis: insights from genetics. Nature Reviews Neuroscience 7, 710-721. J. A. Imlay and I. Fridovich (1991) Assay of metabolic superoxide production in Escherichia coli. Journal of Biological Chemistry 266, 6957-6965.